In China, when speaking of cumin, everyone’s first impression is probably the Xinjiang kebab, and the thick western influence it has. Cumin is actually a very old spice. It was widely known to people of the ancient Egyptian New Kingdom. In ancient Greek times, cumin was a regular visitor to the table. Just like the status of pepper today, there were also records of cumin in the Old Testament, but after the Middle Ages, cumin gradually faded out of the European table (except for Spain and Malta) as the tastes of the people changed. But in North Africa, Western Asia, and Central Asia, it was known for crossing the Silk Road. The cumin is always one of the main ingredients in the area. Another important spice on the Silk Road was cilantro. The history of cilantro is as old as cumin and its distribution areas similar. In China and other countries in East Asia, people generally eat the tender stems and leaves of cilantro. Especially in Central Asia, West Asia and North Africa, the seeds are generally used. I have shared lots of authentic Chinese fried rice, such as yangzhou fried rice, Fujian fried rice, Chinese egg fried rice. 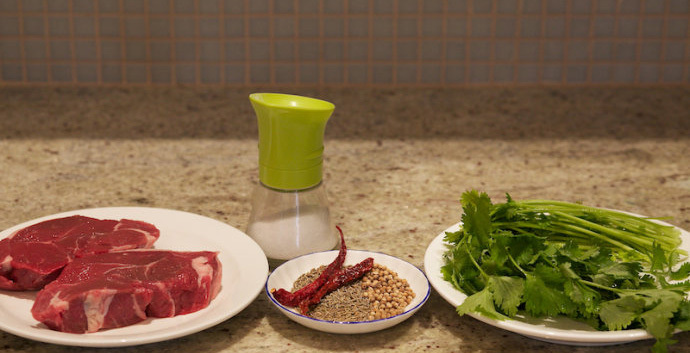 Not too long ago, I share the recipe Cumin Lamb Recipe. Today we tried to share a cumin lamb and a fried rice with these two main ingredients. 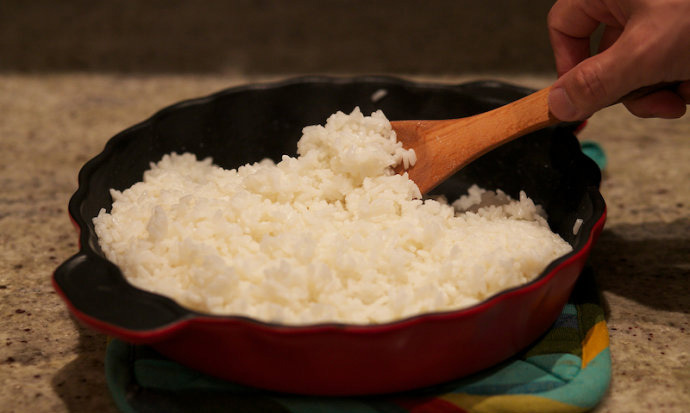 Step 1: The first step is naturally preparing rice. Take 250 grams of rice (round rice is used here, not long rice like Thai rice), put the rice into a pot, rinse it off, add clean water, make the total weight of water and rice 660 g (The ratio of rice to water is 250 g: 410 g). Put the pot on the stove and bring to a boil. After the water boils, turn the heat to low and cover the pot. Keep an eye on the time after the lid is put on. From 15 minutes on, you can open the lid and pick some rice with chopsticks to taste it. When you feel that the texture is a bit harder than what you prefer, you can take off the heat and let the rice sit there. 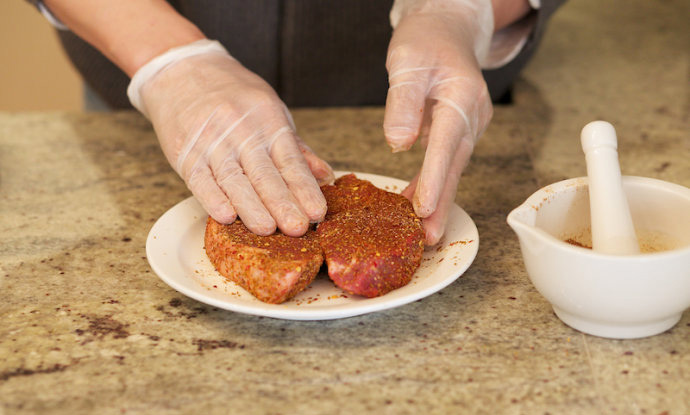 Step 2: Prepare our spices. 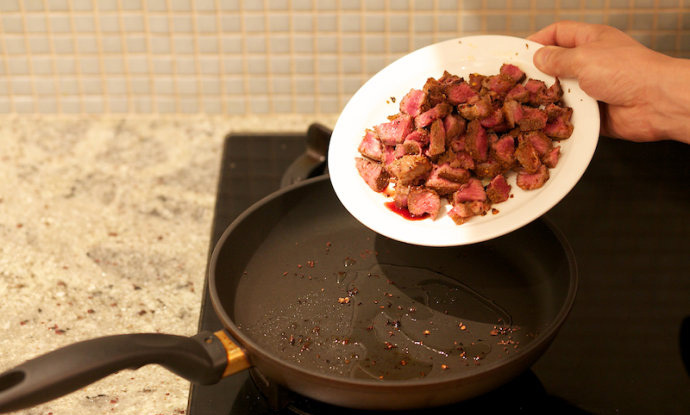 Take a small frying pan and sprinkle the dried red peppers into the pan. 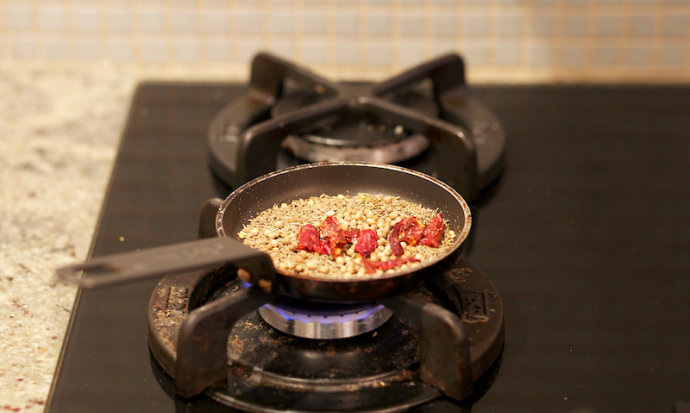 Add the cumin and coriander seeds. Place on a stove and heat over medium for 3-4 minutes. When you able to smell the ingredients strongly, take off the heat. Watch it closely when it is heated. Don’t let it scorch. 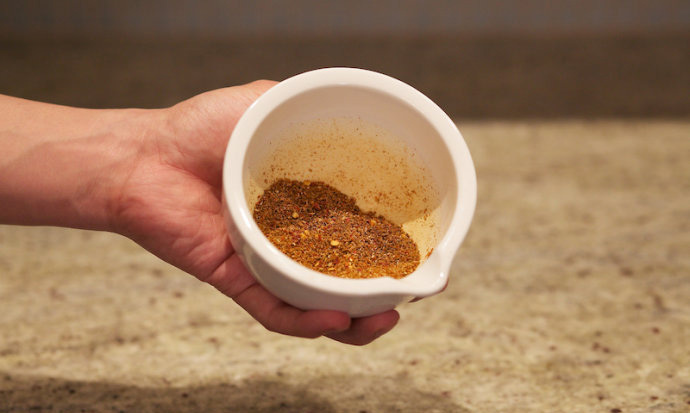 Step 3: Put cumin, coriander seeds, and red peppers into the mortar and add the appropriate amount of salt. 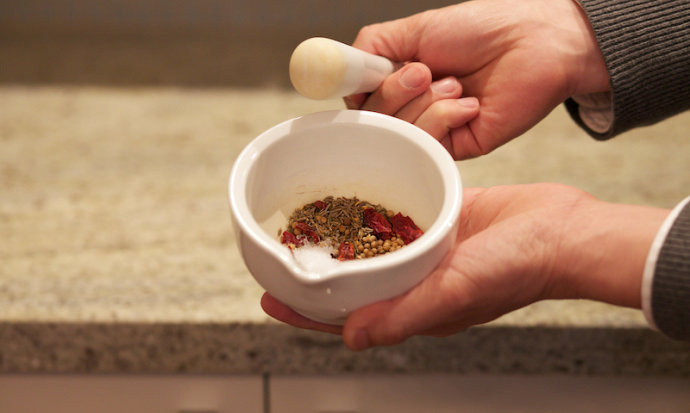 Use the pestle to crush the ingredients together. It’s best to keep it slightly coarse. Step 4: Put the lamb on the plate, thickness is about two centimeters. 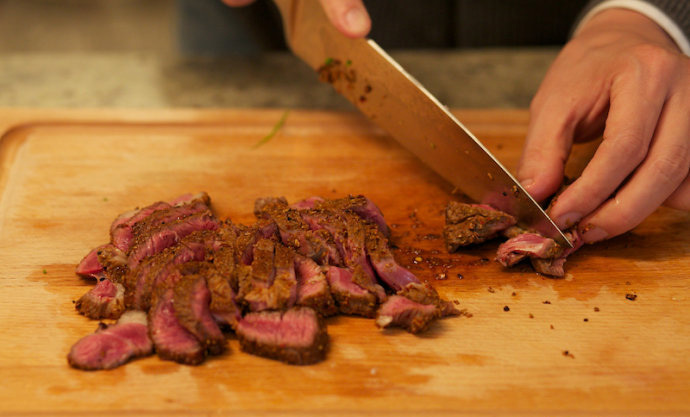 If you buy a thick lamb, you need to cut it to make a thickness of about two centimeters. 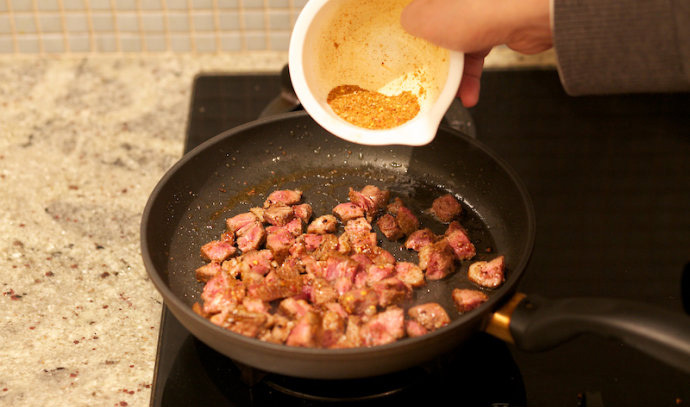 Sprinkle 2/3 of ground spices (cumin, coriander seeds, peppers, and salt) on the surface of the lamb and gently tap it with your hand to allow the spices to stick. Step 6: The cilantro is divided into two parts. The lower stems are cut finely, and the leaves are pulled off and left whole. Step 7: Take a flat-bottomed, non-stick pan and preheat for 90-120 seconds (depending on the weight of the pan, the warm-up time is longer or shorter). Then lay the lamb in carefully. Every minute, turn the lamb over. 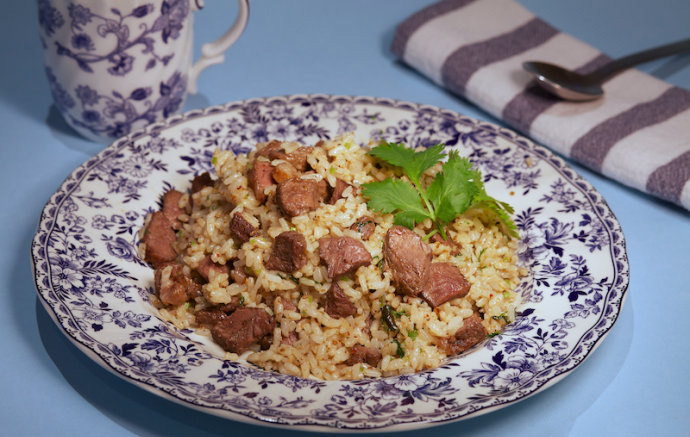 When turning over, change the position of the lamb and let them evenly heat. 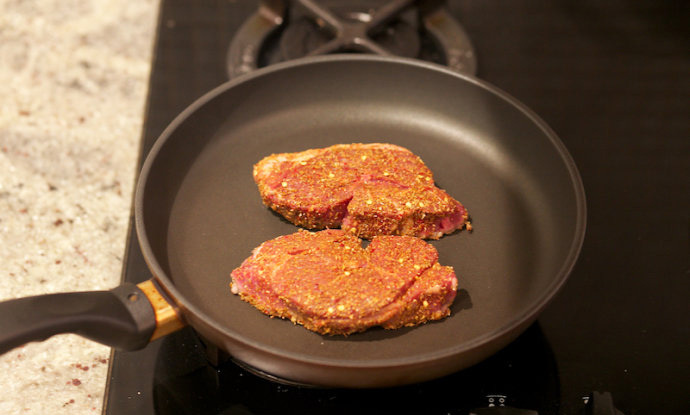 2 cm thick lamb meat is heated for a total of 6 minutes. Step 8: Remove the lamb, cool it slightly, and then use a knife to cut it into small pieces of 1 cm square. When you cut it, you will find that some blood remains in the interior of the lamb. According to Western standards, this lamb should belong to the “rare” category. Step 9: After preheating the frying pan again, put the chopped meat back with small amount of oil to continue heating and frying. Step 10: After putting in the remaining spices, stir well. 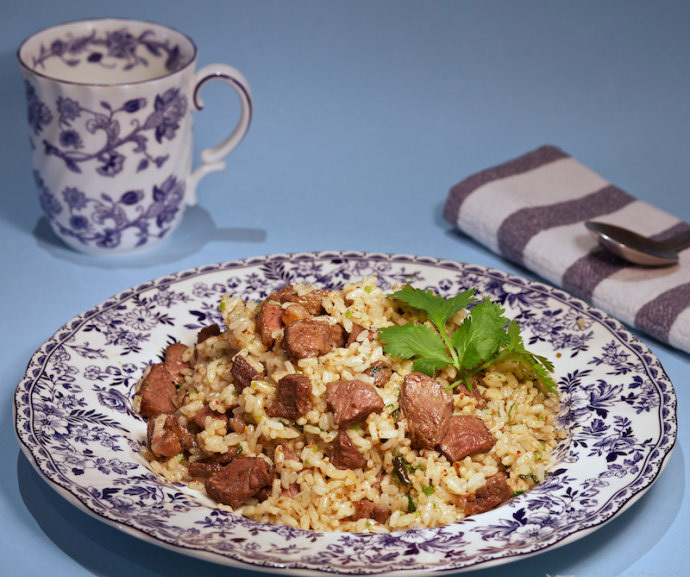 Step 11: Once the lamb has cooked, pour the rice into it. 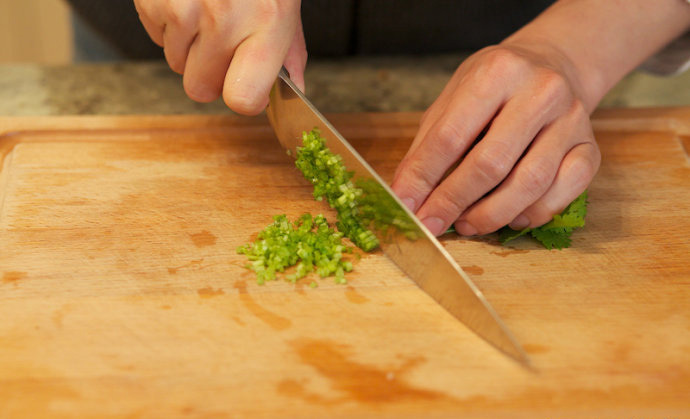 Sprinkle the chopped cilantro stalks, stir well, taste, add some salt to taste if necessary. When you serve, sprinkle the cilantro leaves on top for a bit of flare, and enjoy immediately!